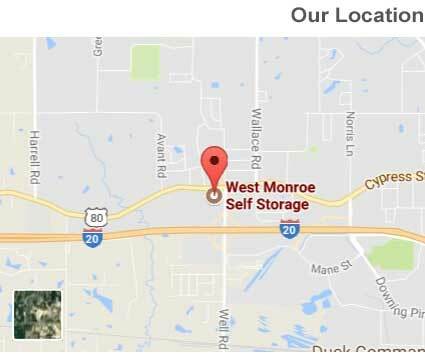 When it comes to providing self storage in West Monroe that is convenient, affordable and offers customer service with a smile, West Monroe Self Storage takes the cake! We have a large range of climate controlled storage units, parking for car, boat, truck, trailer and RV storage, and enhanced security to keep your things under tight watch and in good hands when you store with us. Our commercial and household storage units are great for file and record storage. Long and short term leases are available. For added convenience, all storage units are located on the ground floor and accessible 24/7. Come rent your West Monroe storage unit with us today!